We reached out to our contact at Honda to get the official word on the Honda CR ELECTRIC Prototype. 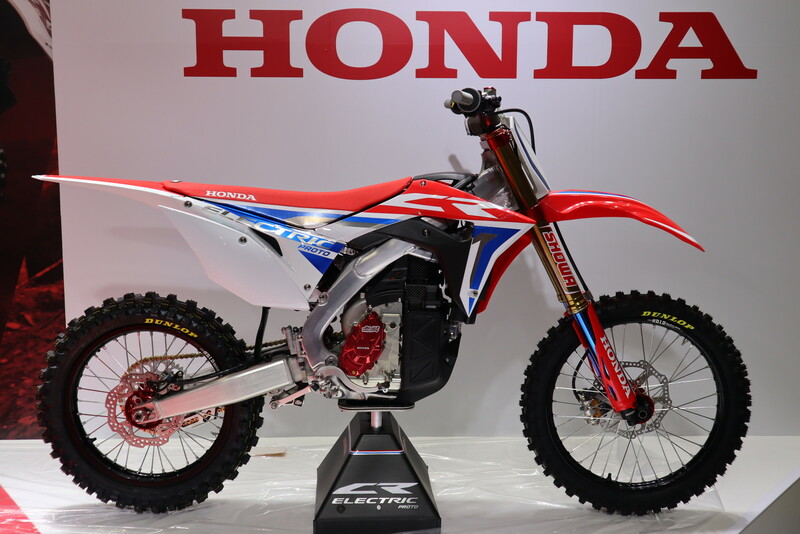 We’ve all seen the photos of the electric motocross bike Honda unveiled at the Tokyo motor show (click here for more photos), but there has only been speculation without any concrete details. This is how fake news starts - if we all just start guessing, then those guesses get repeated until the whole internet agrees that those guesses are the truth (Honda CRF450L having 25 hp ring a bell?) then nobody wins. So we shot a whole slew of questions at Honda to see if any of them stick and only about five did. Not very creative, to be honest, but what can we really expect from a Japanese manufacturer? It is cool that they are continuing the legacy of the ‘CR’ model line, albeit without pre-mix or any fuel at all, for that matter. 2. Is it an actual working prototype, or just a concept? Honda: This model was developed as an electric motorcycle that endures motocross riding over severe terrain. Honda will use technical know-how gained from CR ELECTRIC Prototype to continue development of on/off road electric motorcycle sports performance. Honda aims to tackle EV’s unique characteristics and issues and apply knowledge gained in the future development of retail EV motorcycles. The prototype was jointly developed Honda R&D Japan. Honda was in charge of building the prototype and M-TEC produced the battery power unit. So, what we can gather from this is that it is somewhere in-between. For all the people saying that it looks close to being done and ready for the public, we say this is a long way off. Just because there is one, seemingly complete machine doesn’t mean it works worth a hoot. Both the Honda Africa Twin and the Yamaha T7 adventure bikes were displayed for years at motorcycle shows, even with dirt all over them showing that they were actually ridden before real action was taken to get the bikes to market, and the Yamaha is still not available. 3. What kind of battery does it have? Honda: Lithium-Ion, 1 pack (details on the number of cells are not available). Well, that’s no surprise. Pretty much all electric vehicles use Lithium-Ion batteries. We actually asked what the pack was rated, how long it lasted, and how long it took to charge, but this is all the info they gave us. 4. Is the frame specific to the CR-E or is it from an existing CRF? Honda: 2018 CRF250R frame was optimized for the power unit/battery. Taking a close look at the photos, the CR-E doesn't seem to have any upper engine hangers, but there are front engine mounts. It will be interesting to see how this changes as the bike is further developed. Engine/chassis interaction is a vital part of how a bike feels on the track, which is quite evident when playing with engine-mount materials or even just torque settings on a normal bike. Our guess is that, much like the Alta Redshift, a truly competitive electric motocross bike will have its own chassis since the restrictions on what has to go where (no gas tank or intake) aren’t the same for an electric motorcycle. 5. Will the power be comparable to 250F, 350F, or 450? Honda: Honda aims for 250cc equivalent performance. This is actually really good news. Not that it is specifically aimed at a 250F, but that they have a target at all and are willing to share. If the bike was just a concept with no goal or plan to become a production model, it is more likely that Honda would use the blanket answer that they did with all the other questions we asked - “Detailed specifications are not available for prototype models.” But they didn’t, therefore we can afford ourselves a sliver of hope that the CR-E might be a reality, eventually. What kind of motor? Detailed specifications are not available for prototype models. Does it have gears or a clutch? Detailed specifications are not available for prototype models. Does it have different power modes? Detailed specifications are not available for prototype models. What is the charge time? Detailed specifications are not available for prototype models. How long does the battery last? Detailed specifications are not available for prototype models. Can you swap batteries at the track? Detailed specifications are not available for prototype models. Estimated time of release? There are no plans to release at this time. Estimated price? There are no plans to release at this time. Green/Red Sticker? There are no plans to release at this time. Plans to race? There are no plans at this time. A bit not a familiar model. But I like. I am a fan of Honda and I like everything they release. I wonder how much such a bike will cost? I will soon graduate from the university and I want to buy a motorcycle for myself. I have a dream about which I will write a persuasive essay for my university soon and my dream is connected with the purchase of a motorcycle. You missed to mention that the engine is developed by MUGEN which are pretty much leaders of E-Motorcycles. Just look at their "Shinden" bike taking victories at the TT of Isle of Man....there are tests of that Shinden Racebike.